If you are a follower of Annie’s Gardening Corner, you already know that the Chrysanthemum is the November Birth flower. This is one of the last flowering plants to see blooming in your garden. A favorite pick, Chrysanthemum ‘Sheffield Pink’ is a tough, drought-tolerant variety with soft peach to pink flowers late in the season. When planting ‘Sheffield Pink’, give it plenty of elbow room because it does spread. On this 11th day of November 2009, the inspirational quote of the day is by G.B. Stern. “Silent gratitude isn’t much use to anyone.” Thank You – two words making all the difference in someone’s life. Remember to thank our Veterans. 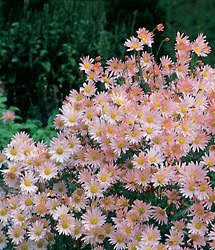 Photo of Chrysanthemum ‘Sheffield Pink’ from the Burpee.com website.